Search and adopt a Chinese Crested Dog near you. 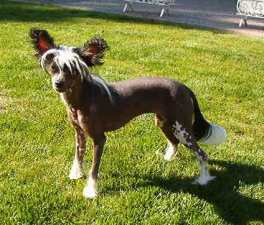 The Chinese Crested dog is a smaller (10-13 lbs.) hairless breed of dog. Like most hairless dog breeds, the Chinese Crested comes in two varieties, with and without fur, which are born in the same litter; the Hairless and the Powderpuff. At first glance, the "Hairless" and "Powderpuff" varieties of Chinese Crested Dogs appear to be two separate breeds, but hairlessness is an incomplete dominant trait within a single breed. The Hairless has soft very human like skin, as well as tufts of fur on its paws ("socks") tail ("plume") and long, flowing hair on its head ("crest "). The Hairless variety varies in amount of body hair. Fur on the muzzle, or beard, is not uncommon. A true Hairless often does not have much furnishings (hair on the head, tail, and paws). The difference between a Hairless and a Powderpuff is that the Hairless has a single coat, often with hairless parts on the body, the Powderpuff has a thick double coat. The skin of the Hairless comes in several colors, ranging from a pale flesh to black. Hairless crested often lacks a full set of teeth, but this is not considered a fault. The looks of the Powderpuff can vary according to how it is groomed. When its fur is grown out on its face, it resembles a terrier; however, the Powderpuff is usually shaved around the snout as a standard cut. The amount of body hair on the hairless varies quite a bit, from the true hairless which has very little or no body hair and furnishings, to what is called a hairy hairless, which if left ungroomed can nearly grow a full coat of hair. These hairy hairless are not a mix between powderpuffs and hairless Chinese Cresteds, but merely a result of the varying expression of the hairless gene, which the powderpuff does not have at all. One famous Chinese Crested dog was the hairless purebred named Sam, dubbed the "World's Ugliest Dog" in competition from 2003 to 2005. Both varieties require a certain amount of grooming. The Puffs have a very soft and fine double coat a frequent brushing is needed to avoid matting. Although a Puff's coat does not continuously grow like that of some other breeds, it can grow to be considerably long at full length. This breed has little to no shedding. Maintenance of the hairless variety's skin is much like taking care of human skin. . It can be susceptible to acne, dryness, and sunburn. Hypoallergenic or oil-free moisturizers can keep the skin from becoming too dry when applied every other day or after bathing. Burning can occur in regions that lend themselves to strong UV-rays, especially in a lighter-skinned dog. Many owners apply baby sunscreen to their pets before spending time in the sun. Some Cresteds have skin allergies to Lanolin, be cautious when using any products that contain it. Unless the dog is a "True" Hairless (one with virtually no hair growth), trimming and/or shaving is often performed to remove stubble growth. Its hare foot further distinguishes the Chinese Crested, (having more elongated toes) as opposed to the cat foot common to most other dogs. Because of this the quick of Cresteds run deeper into their nails, so care must be taken not to trim the nails too short. Back in the 1920s, Debrorah Woods and Ida Garrett jointly created the 'Crest Haven Kennel' and began to purposefully breed and record the lineages of their Chinese Crested dogs. Their dogs are the foundation of every Chinese Crested alive today. They founded the American Hairless Dog Club in 1959, which was eventually incorporated into the American Chinese Crested Club (ACCC). The ACCC became the US parent club for the breed when the American Kennel Club recognized the Chinese Crested thirteen years later, in 1991. The Chinese Crested breed, either in purebred form or as a hybrid with chihuahua, has won eight of the World's Ugliest Dog Contests.